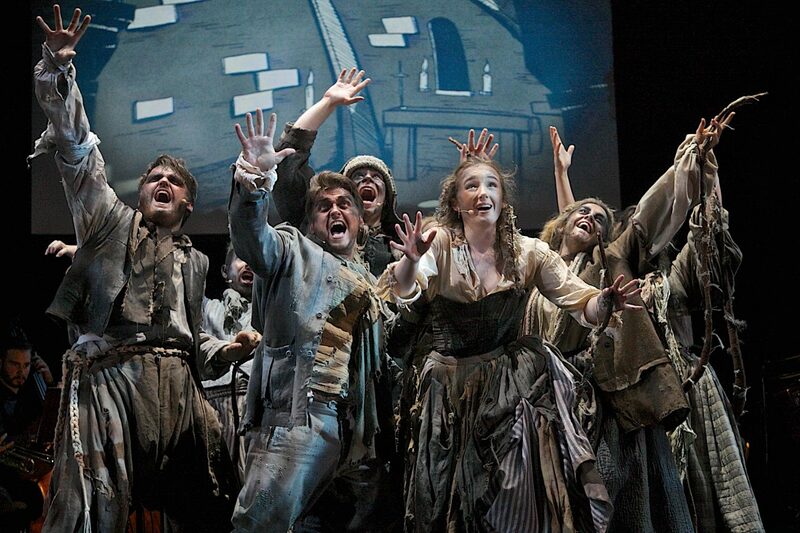 The eagerly awaited addition to the Sherman dynasty scurried into the West End on Sunday 4th September with a star-studded charity gala performance of Bumblescratch, a new musical about a filthy rat during the Great Plague and the Great Fire of London. On the surface Robert Sherman’s show has all the makings of a great musical – a renowned composer, a talented cast, artistic costumes and intriguing subject matter surrounding two of Elizabethan Britain’s most shocking events. Unfortunately it just doesn’t come together as one would hope. Bumblescratch is a musical that doesn’t quite know where it’s going. Lascivious rat Melbourne Bumblescratch tells gruesome tales of London town in the 1600s after adopting a young rodent Perry as his sidekick. We learn he has stolen a precious jewel from King Rat Socrates and regularly dreams of a phantom friend, pirate rat Hookbeard, after eating dodgy cheese. For almost an hour you think it’s rivalling Cats with a seemingly lacking plot. Just as you settle into the concept of ‘Rats’ you hurtle into a storyline as Perry falls in love with a human girl, forcing Melbourne to watch over her before being brutally clubbed to death by her baker father. All within the last ten minutes of the first act! For a show billed as a ‘family musical-comedy’ it seems to have some identity issues. I don’t know many children who enjoy tales of whores being eaten, and I certainly didn’t hear many of them laughing in the theatre that night. The score is obviously sophisticated with hints of beauty, particularly before the interval with Music of the Spheres and My Place in the Sun. There’s no stand-out hit – the one that you leave the theatre humming – but there could be. I felt these songs weren’t always explored to their full potential before moving on. Saying that the cast performances were outstanding throughout the ensemble making the gala enjoyable despite the musical’s issues. Darren Day does his best to navigate you through a difficult plot, instantly establishing a likeable narrator in Melbourne Bumblescratch. His witty and funny performance is to be commended alongside young star Ilan Galkoff as Perry, who handles a particularly mature and vocally-heavy role with ease. Michael Xavier is simply stunning as Hookbeard, although not nearly used enough during the show. Mention must go to Cathy Read as Thamesa whose gorgeous vocals will be heard from another West End stage soon I’m sure. It’s almost a shame to criticise something that has so much potential but it does need work. A plot outline in the programme is something I usually think redundant but in this case it was a necessity! You shouldn’t have to study the show afterwards just to find out what happened, especially when it’s described as a family show. However I’d like to see the show again after some work, and definitely with a similarly talented cast. Review organised by #LDNTheatreBloggers. Want your show reviewed? Access a two-hundred strong blog community through Theatre Bloggers.